Caption slip reads: "Photographer: Wesselmann. Date: 1960-05-31. Reporter: Greenberg. Assignment: Democratic $100 dinner at Beverly Hilton Hotel. 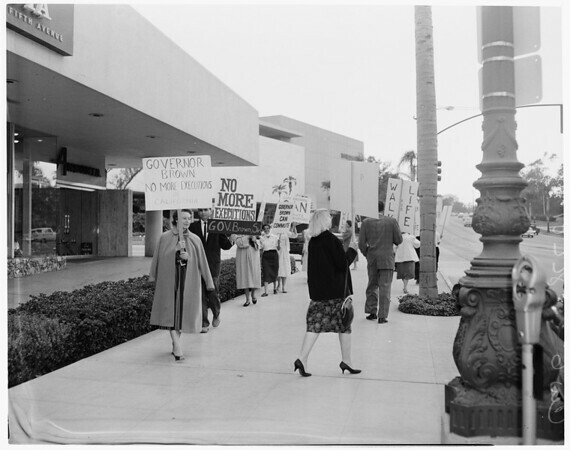 6-7: A group of 'Los Angeles Citizens Against Capital Punishment' picketed Gov. Brown outside the Beverly Hilton Hotel on Wilshire Boulevard for several hours during the banquet inside. 9: Gov. Brown is presented scroll by Supervisor Debs -- head table shot with all senators. 13: Senator Kennedy greets well-wishers after dinner -- Stanley Mosk at left. 15: Senator Symington and wife (rt) greet well-wishers after dinner. 16: Senator Johnson greets D.A. McKesson after dinner during a period of informality."